Central New York, CNY Oneida Indian Native American Legends, History & Lore. Learn about Wellnesste Lodge near Syracuse, Rome, Utica, Camden, NY. The Legend of Garnet Rock at Wellnesste Lodge. Central New York Native American History. For many, many moons, Native Americans would make their summer camp along the bank of Fish Creek in what is now known as Central New York. They would pass long warm summer days fishing, swimming and foraging for their winter caché of berries, roots and other edibles. One day a brave warrior named Running Bear fell in love with a beautiful Native American maiden from a neighboring tribe named Garnet Eyes. They met on the river as Running Bear was spearing brook trout and Garnet Eyes was washing freshly foraged Cattail Roots. They quickly fell in love and were preparing to be married. Their love was deep and was admired by both of their villages. One summer evening an enormous thunderstorm sent rain down on the villages and rushing down Fish Creek. Garnet Eyes was taken by surprise while gathering choke cherries for her wedding on the bank of the river. The swiftly rushing waters swept her away before anyone could help her. When the storm was over, Running Bear looked everywhere for his true love. One of the village elders explained how Garnet Eyes had been lost to the swift waters of the river. In his sorrow, Running Bear returned to the large rock in the river where he had first spotted Garnet Eyes. He remembered her kindness, love and beautiful Garnet colored eyes that were so full of life. He wept sorrowful tears and prayed to the great-spirit-that-lives-and-moves-in-all-things that he would be reunited with Garnet Eyes. As Running Bear’s tears fell on the large smooth rock that protruded from the river’s water, he could hear the Great Spirit playing a song of love with this flute. Running Bear disappeared and where his tears had fallen onto the rock, beautiful garnet crystals shone in the sunlight. It is said that the Great Spirit answered Running Bear’s prayer and that he and Garnet Eyes were reunited forever. To this day, visitors still come to sit and see what is now known as Garnet Rock. 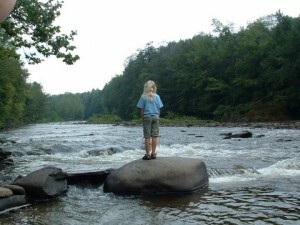 The large boulder sits near the river’s edge, untouched for hundreds of years except for the wear of the river’s waters flowing over and around it year ‘round. As visitors sit and look closely at Garnet Rock, they can see the magnificent garnet crystals lodged within the boulder- scattered where Running Bear's tears had fallen many moons past. These unique garnets symbolize a love that never dies. In a society where love seems fleeting and time is always rushed, it is good for one to experience Garnet Rock and to contemplate the power and intention of true love.